The 2018 edition of the culinary contest Olivier Roellinger is officially launched now. The competition is open to young and future chefs who want to contribute to the conservation of marine resources and the protection of the seas and ocean. Deadline for submission is due 4 January. The Flanders Marine Institute (VLIZ) is partner and hopes to welcome a lot of applications from Belgium and The Netherlands! Organizer of the contest is Ethic Ocean (www.ethic-ocean.org). They receive the personal support of the French seafood chef Olivier Roellinger and many other partners, among others the Flanders Marine Institute (VLIZ) in Belgium. Are you interested to be part of this great adventure? Then write to concours@ethic-ocean.org to require a registration form. Applications are welcomed in English, French or Spanish. The contest is open to young European chefs under the age of 35 and students undergoing a training in a European catering school. State the category you want to participate in: as professional or as student. You get until 4 January 2019 to create two recipes with sustainable seafood and prepare your registration form. The brochure with the general presentation of the culinary contest, the rules and prizes are available in English, French and Spanish. Since 2016 the (originally French) culinary contest Olivier Roellinger has been extended on a European scale and is open to candidates from all European countries. The assignment is to create two recipes with sustainable seafood and to defend the species of choice to a jury. 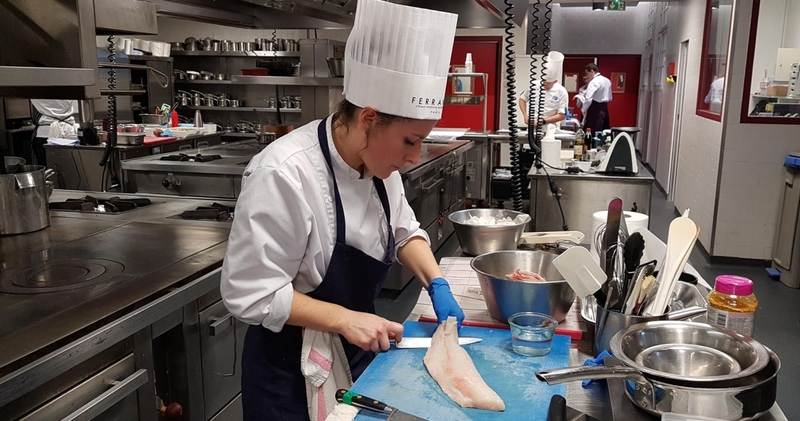 Selected candidates within the category young professionals will be invited to cook and defend their species of choice in the Ferrandi Paris catering school (8 April 2019). Selected student chefs will have to present their skills and knowledge in one of the participating catering schools in Sweden, France, Hungary or Spain. Candidates from western Europe participate in the jury at the Yvon Bourges Dinard catering school in Bretagne, France on 20 March 2019. Information (photo, video, winners and prizes) of former editions can be found on the website of Ethic Ocean and their Facebook page.